Available in our American, Canadian, New Zealand and Australian schools, the Semi-Intensive course gives you extra classes two days per week. The extra time in class helps to further consolidate your English knowledge, allowing you extra time to practise your language skills. Our tried and tested formula for teaching English trains you in how to use the 'real' English you need to communicate effectively in an English speaking environment. Teachers take themes from textbooks and bring them to life in the classroom. You will learn the English that native English speakers really use and how and when to use it. We will focus on your overall level of English by showing you how to better use the English you already have, and then introducing you to new forms and patterns that will help to further your English ability. While you develop a better understanding of English with EC, you will notice that your ability to communicate in English becomes more natural. Accessing the words you want to use becomes easier and so does your ability to listen and understand quickly. As you start thinking more in English (and using your new English skills) you will notice the changes in your level of fluency. At EC, we teach a range of topic-based lessons. Each lesson is accompanied by the language you need in order to effectively talk about the topic. This means the English skills you learn are taught within an easy to understand framework; the topics serve as clear and easy to follow examples. You can then work on applying your new skills simply, naturally and with great effect. 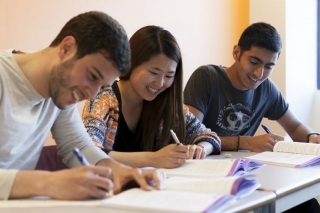 Your teachers will provide the support and guidance you need to improve your English. Individual focus on your progress will be provided throughout your course. Teachers provide feedback, error correction and helpful instruction on all areas of your English. To create a good classroom environment, our teachers make sure their classrooms have positive atmospheres. Classes have a warm, supportive environment which help you to develop confidence in participating in all activities. The benefit of having quality lesson plans and related curriculum resources to use in class is that it allows our teachers more time to focus on what's most important – teaching you! You can expect supplementary materials to be used alongside textbooks to perfectly complement your lessons. One of the best ways to learn how to do something is to do it. English language success is achieved through practise, self-perfection and appropriate modifications. You will have the chance to be actively involved in all activities in your class! In our Australia and New Zealand locations, our Semi-Intensive English course is called the Standard Plus Programme.